My son's daycare has fun days that the kids participate in - pajama day, teddy bear day, crazy hair day, etc. - that are so much fun! Today is International Chocolate Day! Who knew there was a day dedicated to yummy, sweet chocolate?! Since it wasn't something he could "do", I decided to make his teachers a little treat. 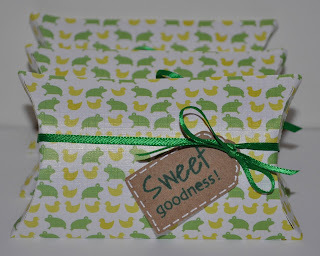 I LOVE this paper full of ducks and frogs, because it's just perfect for a toddler teacher! The sentiment is from My Pink Stamper new 'Yummy-licious' set. Those are cute and you are right that is fun paper. So cute! I love the paper! Cute paper! I don't know about you but to me, EVERYDAY is Chocolate Day!! This is darling and you're right about the paper! So super cute! I just love these pillow boxes. Are these from the Art Philosophy cart? How "sweet" of you! Great project!